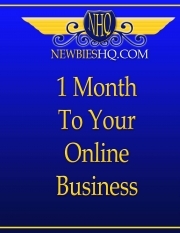 Description of "1 Month to Your Own Online Business (eBook)"
Online Marketing. This is not new. There were companies making money on the internet back in the ‘information superhighway’ days, which helped to fuel the .com boom and subsequent implosion at the end of the 90s. But what is new and different is the fact that anyone who has an internet connection and a computer can now start their own internet marketing business quickly, easily and with very little capital outlay. Generally involves with Zero Investment. Get the book to discover the secrets about starting your own online business without a penny and taking it to a high level. This book is specially designed for those who want to earn money online starting an online business. It gives all details and hidden facts about getting on the queue. Get it and start profit. Gabor Olah is an Internet marketing product creator and article author. He has many Websites for his products and also has several ebooks that he has sold in marketplaces like Lulu. He participates in Internet marketing forums such as the Warrior Forum where he has been active since 2006. He is a very well-respected Internet marketer. Reviews of "1 Month to Your Own Online Business (eBook)"